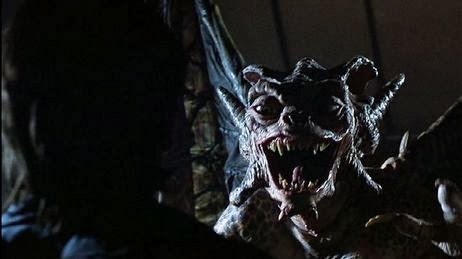 As a three-part anthology/portmanteau effort from the mid-80s, Tales From The Darkside may not look like being anything special but its memorable for a few reasons. The main thing is the casting with lots of legit acting talent making an appearance throughout the film. The first famous face shows up in the film’s intro/linking story. 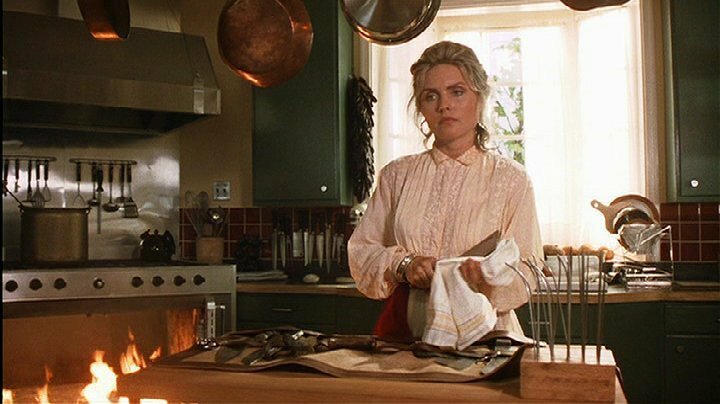 Debbie Harry (Blondie) plays Betty, a wealthy housewife who is setting up a dinner party. She’s also a witch who has kidnapped a paperboy and has been fattening him up so that she can cook him. Worst ‘Come Dine With Me’ host ever. The kid is pretty smart though and distracts her with tales from a book (titled after the film). Theirs is a darkly comic tale which is played straight by Debbie Harry and provides a good launchpad for the film’s three main segments. The first main story is ‘Lot 249’ which tells the tale of Bellingham, a graduate student played by Steve Buscemi, who has been cheated out of a scholarship by his classmates Lee and Susan (played by a young Julianne Moore). 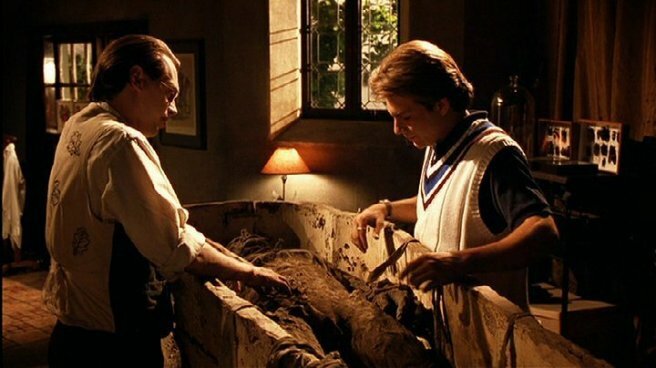 Luckily for Bellingham, he’s acquired a sarcophagus complete with a mummy which he reanimates, Evil Dead-style. After the mummy murders Lee and Susan, Andy (played by Christian Slater) goes after Bellingham and threatens to burn him alive. Instead he makes Bellingham leave town. Which is a big mistake as Bellingham somehow manages to send Lee and Susan after him from beyond the grave. Eek! The story is your classic mummy effort but the acting, particularly from Julianne Moore, does elevate things even if the effects are pretty ropey, especially on the mummy itself. Steve Buscemi has never been young. Next up is ‘Cat From Hell’ which is an incredibly well crafted segment. It features Drogan, a wealthy old man, and Halston, the hitman that he has hired. Halston, played by David Johansen (the cabbie from Scrooged), arrives at Drogan’s mansion ready to accept a contract and is surprised to find that the intended mark is Drogan’s cat. You see, Drogan made his money in pharmaceuticals and his biggest selling product may have been responsible for killing over 5000 cats in testing. So he thinks the cat is an avenging angel cat here to punish him and it’s already taken out all of his family and his butler (played by Mark Margolis). What ensues is a noir assassination thriller with plenty of black comedy as the cat continues to get the better of Halston who goes from slick hitman to a picture of madness and frustration. Ultimately the cat wins by, and I’m not making this up, climbing into Halston’s mouth and suffocating him. Drogan turns up the next day to see the cat re-emerge and attack him causing a heart attack. It’s a baffling tale which mixes some stylish direction and excellent acting with some comedically bad cat effects, including some pretty funny facehugger action but overall Johansen’s performance makes this a portmanteau segment for the ages. Fantastic. Last up is ‘Lover’s Vow’ which begins in a bar where Preston, a struggling artist played by James Remar (Dexter’s dad or, more importantly, Lord Raiden in the second Mortal Kombat flick), is getting drunk and wondering where his life is heading. He leaves with the bar owner who offers to help him get home. Unfortunately, when they get outside, the bar owner is decapitated by a winged demon who then turns to Preston and offers to let him keep his life if he promises to never tell anyone what he saw and Preston sees that as a deal worth taking and gets the hell out of there. Later that night, he runs into Carola (played by Rae Dawn Chong from Commando) who he pulls off the street, telling her it’s not safe to be out in that neighbourhood at night. She goes back to his to call a cab but ends up staying the night. Time progresses in the story and shows them falling in love, getting married and having kids. 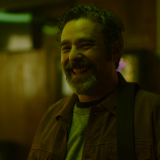 Preston becomes very successful when Carola introduces him to a mutual acquaintance and life is good but Preston is haunted by what happened that night (as evidenced by him drawing the demon over and over). Ten years after that fateful day, Preston can’t bear the weight of his secret and tells Carola everything. She’s upset but it turns out that’s because she’s the demon (to be fair, that seemed the obvious twist as soon as she turned up). What is unusual is that she really did love him but by breaking the promise he turns her, and their two kids, back into demons. Even as a winged demon she still loves him but has to chew out his throat and the segment ends with her and the kids sat atop the building as gargoyles, looking down mournfully at his body. I guess this is Dexter’s mum then. 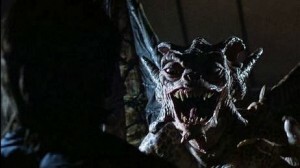 Overall, Tales From The Darkside is a strong portmanteau. The linking story is okay and even the weakest of the stories (Lot 249) is still pretty decent. 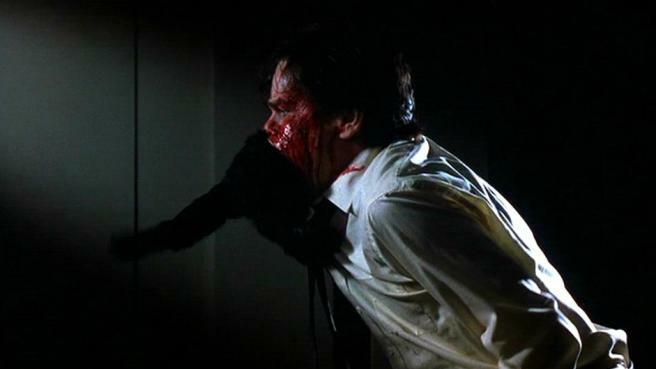 ‘Cat From Hell’ is elevated by George A Romero’s excellent direction and ‘Lover’s Vow’ is just a well-crafted tale. It’s also a ton of fun to live-tweet when you’re watching it! Portmanteau-a-go-go #8 – Twilight Zone: The Movie Ten reasons why Ghostbusters is the best film ever made.